The Panasonic MA70 is one of the premier massage chairs available today. It comes with 36 airbags targeting the calves, soles of your feet, arms & hands, buttocks, waist and shoulders. It features 460 square inches of massage coverage: seat & hip; shoulder; calf; arm & palm massage – plus leg and arm stretching. It also has a “smart” remote control with voice guidance system. Read on to find out how we rate this chair, and what its strengths and weaknesses are. The Japanese multinational Panasonic is one of the leading electronics corporations in the world and is currently celebrating its 100th anniversary. The company offers a multitude of products including electronic massage chairs like the EP-MA70. This worldwide brand has stood the test of time and has been producing high-quality items for decades. This chair has an upright dimension of 45.3 H x 37.4 W x 48 D inches and a reclined dimension of 26 H x 37.4 W x 79.6 D inches. Recommended User Height: From 4’6” to 6’1”. The Panasonic EP-MA70 is covered with a 5-year warranty. In its first 3 years, labor and parts are covered. The unit will also be serviced at home without any additional cost. The remaining 2 years cover parts only. Heated 3D Massage Rollers – It comes with one of the most human-like massage rollers available in a massage chair. A professional masseuse’s hands are simulated by the heated rollers. Body Scan Technology – This hi-tech massage chair uses advanced pressure sensor technology. It creates a virtual map of your back. As the chair scans the body, the massage becomes more consistent to your needs. Acupoints – It works with a multitude of techniques to properly target different acupoints. Junetsu Massage – This is a very exclusive feature from Panasonic. It helps loosen up the tight muscles. With help from its thumb-like rollers, it delivers precise massage solutions for relieving stiffness. It comes with 6 preset programs that are automatic: Refresh, Shiatsu, Deep, Lower Back, Neck and Shoulder, and Hip. You can also form your own massage program by using manual modes like: Swedish, Junetsu Ultra Kneading, Kneading, Tapping, Shiatsu, and Rolling. We’ve pretty much listed down all the bells and whistles you can get from MA70. However, we want to highlight what really stands out about this chair, especially if you compare it to other brands and models. Most massage chairs have these two separate – rollers and heat. In most chairs, the rollers knead and tap through your entire body while the heating component usually warms your lumbar area (lower back) and maybe calves. In the MA70, however, you get both which, as you can imagine, levels up your massage experience. It amps up the feeling of being massaged by human hands. And imagine jumping into your Panasonic chair when the weather is below zero outside. It’s especially useful for old folks with cold, creaky bones. While many budget models offer an adequate massage, the Panasonic justifies its higher price tag with superior massage technology. This is because of a combination of factors. First off, is the 3D scan tech. Because it scans your body prior to a massage, it is able to customize the positioning of the rollers and tailor-fit the massage session for you. Next, the 3D rollers move up/down, left/right, and in/out. They can move back 2 inches more than regular rollers so that you get a significantly penetrating massage. Which brings us to the next definitive feature of the MA70 – its hard and penetrating massage. 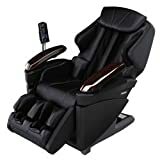 While the intensity of a massage is a matter of preference, there are many buyers who seek out massage chairs that can offer an experience similar to deep tissue massage. And if you’re one of these people, then you’re definitely reading about the right massage chair. If the Inada can lull you to sleep with its relaxing and comparatively weak massage, the Panasonic EP-MA70 will definitely have you stay awake for the duration of your massage session. There are 3 intensities so you can adjust exactly how hard your massage to be. Isn’t the white version divine? Great for singletons but maybe not for families with small children. We’d have to say, the MA70 is a beautiful piece of design. While other massage chairs look bulky, cumbersome, and even uncomfortable, this chair is very stylish and sleek. When not in use, you can hide and fold away the leg ports. And if you take out the ottoman it comes with, then it doubles as a comfortable recliner. It’s definitely a great addition to your living room or any room you decide to put it into. The Panasonic MA70 has an actual memory function. Not many massage chairs have it. You get 3 memory slots and you can save custom massage programs you create for yourself. This lets you conveniently access favorite custom settings, say, if you have a separate program for pain relief and a separate program for a more relaxing massage session. Its body stretch function. Not many massage chairs have this. Airbags in the leg area secure you in place as the chair slowly reclines. You can also stretch targeted areas like the hips, chest, and legs. The experience is similar to a session at your chiropractor’s. Because my pros list is getting rather long, I’d thought of doing away with this last item but decided against it because of so much favorable feedback about the remote. It is amazingly easy to use despite the ton of features in this chair. You’d think there’d be a steep learning curve or that it would be clunky to use but the “smart” feature walks a beginner through the various options until you get the hang of it. And it’s very effective. It’s a very smart move from the designers of this piece of hardware. This chair is not as expensive as say, the Luraco, or the Dreamwave, which we classify as our premium massage chairs but it’s quite close in price. It’s definitely not a budget chair and not average in price. The industry standard is 30 minutes so it’s quite strange that Panasonic decided to default theirs to 15 minutes AND make it non-adjustable at that. If you like your massage to take longer, you’re out of luck. The best you can do is to repeat 1 massage session. Okay, so we praised the heated rollers. And they’re great. However, the designers did away with the more common heating component in the lumbar area and/or calf area. We’d have wished for both but apparently, you can’t have your cake and eat it too. This model has 33 second-gen airbags running through the entire chair. This is about average when compared to other similarly priced brands and models. Because it doesn’t have a space-saving feature, this chair takes up a lot of space when reclined and the leg ports are pulled out even further. If you have very limited space at home, we recommend you find another model with a space-saving design. It’s not a dealbreaker but Panasonic is a known brand for good quality speakers and it would have pushed up the value of the MA70 more if they had integrated some into the design. It’s also more convenient to have music built into its system so you don’t have to set up an external music device just to play music. But like we said, it’s not a big deal. The Panasonic MA70 is not your ordinary budget chair. It has a higher price tag but it comes with a horde of bells and whistles that a home user will definitely be able to optimize for relaxation, rejuvenation, and even pain relief. If you are looking for a chair with a hard and penetrating massage that has excellent massage technology, then the MA70 may be just what you are looking for. And if you like this model a lot, don’t miss checking out the Panasonic MA73. It’s basically an upgraded model of the MA70.